Where else but the nation’s oldest city could one expect to see a 600 year-old tree? 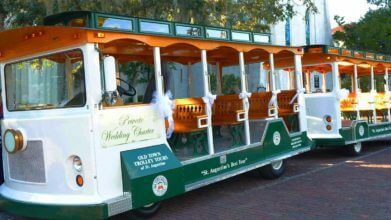 Aboard Old Town Trolley Tours, we’ll take you to the grounds of the Howard Johnson Express Inn—in the epicenter of the city’s historic downtown and just across from the Fountain of Youth. Here, our guests are treated to a breathtaking view of one of nature’s grandest granddaddies—the Old Senator. For 600 years, this glorious Live Oak Tree has stood as a testament to Ponce De Leon’s discovery of La Florida in 1513.